Over the past twelve months we’ve witnessed a shift in how companies are tackling their application security challenges. Join a CISO, an AppSec guru, and IoT security expert to hear industry leading perspectives on the trends that have emerged over the past year, and what to look forward to in the next. 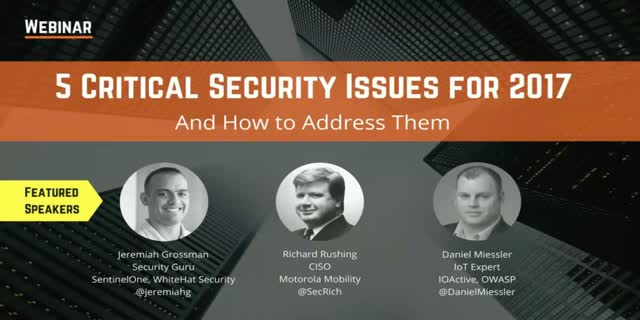 Our all-star panel of industry experts includes Jeremiah Grossman, Founder of WhiteHat Security and Chief of Security Strategy with SentinelOne, Daniel Miessler, Project Leader: OWASP IoT Security Project and Richard Rushing, CISO at Motorola Mobility, for a discussion on what trends every security professional needs to be aware of for 2017. • How will AI and Machine Learning impact protecting your company’s fate? While the crowdsourced security economy is growing across all industries, many still wonder if bug bounties and vulnerability disclosure programs put white hat hackers at legal risk rather than authorizing access and creating legal safe harbors. Who dictates the rules of the crowdsourced security economy? Who safeguards the legal interests of the individual hacker, the Crowd? Last year saw dramatic shifts in the cybersecurity landscape. The number of data breaches and cyber-attacks is skyrocketing. CISOs and security leaders are struggling to find and invest in the best approaches to combat cybercrime for their organizations. Traditional application security testing methods just aren’t cutting it anymore, leaving so many organizations vulnerable. To get a better understanding on what is top of mind for cyber security leaders this year, we surveyed more than 250 CISOs, CIOs, CTOs and CIOs across different industries and regions. There is no silver bullet against targeted and enduring attacks, and the reality is that if an external threat has enough resources at its disposal there is nothing that will make companies 100% protected. Now more than ever, companies need to reexamine how they think about cybersecurity, empower their security teams, and prioritize security programs against competing internal initiatives. Building and maintaining the appropriate mix of cybersecurity resources, processes, and company-wide emphasis can be a challenge for all companies regardless of their size or security maturity. Register now to learn 3 core lessons learned from the Equifax data breach, and why many security leaders are adding Vulnerability Disclosure programs to patch vulnerabilities faster, give visibility and priority to known issues, and refine their SDLC. The pioneer and innovator in crowdsourced security testing for the enterprise, Bugcrowd harnesses the power of more than 65,000 security researchers to surface critical software vulnerabilities and level the playing field in cybersecurity. Security vendor products are held to a higher standard of security—and for good reason as the very existence of their organization could be at risk due to a vulnerability. Many of these vendors are turning to bug bounty programs to not only find any vulnerabilities in their products and services, but also to provide assurance to their clients. Traditional methods for vulnerability discovery are failing us. With rapidly expanding attack surfaces, motivated adversaries, and the growing shortage of full-time infosec professionals, organizations are fighting a losing battle. One thing is clear: We need a new approach. Enter the Bug Bounty model. Bug bounties have quickly evolved from a “nice to have” to a “must have” for most application security teams. What’s behind this trend? Why are bug bounties growing, and why now? Join our expert panel as we discuss the key findings from The 2017 State of Bug Bounty Report. In the past several years, bug bounty programs have disrupted the pen test norm, and provide organizations with a robust and all-encompassing security assessment solution. Instructure, the company behind Canvas Learning Management System (LMS), made the switch three years ago and have never looked back. When combined, these adverse conditions form a ‘vulnerability cycle’ – leaving organizations susceptible to a breach or worse. We will explore InVision’s bug bounty experience from conception to being critical to their customers’ confidence in their security. Despite thousands of large and small organizations running bug bounty programs, there is still a lot of fear and uncertainty about these in the cybersecurity community. In this webinar we will explore 7 myths about Bug Bounty programs, the hackers who are involved, and the impact they are having on the security posture of organizations around the world. Bug bounty programs are moving from the realm of novelty towards becoming best practice. While bug bounty programs have been used for over 20 years, widespread adoption by enterprise organizations has just begun to take off within the last few. Bug bounty programs have increased 210% percent since 2013. Bug bounties provide an opportunity to level the cybersecurity playing field, strengthen the security of products, and cultivate a mutually rewarding relationship with the security researcher community. Join Bugcrowd, SANS, and a customer panel as we discuss the momentum behind crowdsourced security. Our 2016 State of Bug Bounty Report announced that bug bounty programs adoption has increased 210% since 2013. As more and more companies leverage the capabilities of the global researcher community to identify critical vulnerabilities, we must ask...has the bug bounty economy reached a tipping point? Join Bugcrowd as we unpack the top trends in crowdsourced cybersecurity and review the key findings from The State of Bug Bounty Report 2016. This guest webcast features Jake Kouns of Risk Based Security and Christine Gadsby of Blackberry who will be giving their Black Hat 2016 talk, analyzing the real risk of using OSS and the best way to manage its use within your organization. Catch Kymberlee Price's Black Hat 2016 talk in a live webcast. This presentation will address some best practices and templates to help security teams build or scale their incident response practices. In our wired, connected world, software flaws are inevitable – so why not utilize the nature of our connected world to work with a distributed immune system made up of thousands of security researchers? This webcast will provide in-depth analysis based on extensive academic research, conversations with CISOs experienced in running such programs, and the security researcher community. In this webinar, we will highlight the business, technology, and organizational values companies derive from these bug bounty programs. Finally, the talk will identify the common myths, fears and barriers for participation, and suggest recommendations to counter these barriers.